Sign Up for Our Emails and Receive a $10 Off Discount Plus a Free Guided Meditation! Stepping into the center is in itself a calming experience. The atmosphere is a respite form the bustle of Braddock Ave. I leave with a peaceful outlook and a healthier body. I have received both regular massage and hot stone massage from Beth. Both were truly wonderful experiences. She has a deep understanding of therapeutic application of massage and its healing power. I leave my sessions relaxed, rejuvenated, and clear minded. Beth is a wonderful gift to the center and her clients! I’ve experienced many different types of energy and bodywork, and Nikki Remic’s Cellular Expansion treatments have been the most profoundly relaxing and restful sessions I’ve ever had! I highly recommend them! 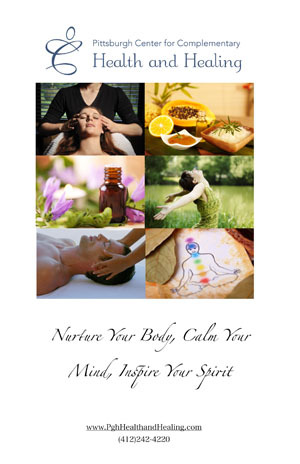 I have been coming to the Center since winter of 2008 for massage, classes and other events. It is so nice to be warmly welcomed by these women, who are responsive to your individual needs and concerns. The atmosphere is peaceful and positive, and you will always leave feeling 100% better than when you came. A massage with Nikki Remic is unlike any other that I have had. It is truly a spiritual experience. From the moment the massage begins, I always feel an instant inner calm and peacefulness. Nikki seems to have a magic touch that goes way beyond good training and strong hands. Her personality mirrors her work; strong, centered, and serene. I recommend her with the highest regard. Enter your Pittsburgh Center for Complementary Health and Healing username. We look forward to supporting you in reaching your physical, emotional, mental, and spiritual health goals! Copyright 2005-2015 © All rights reserved. All content, text & images are property of the Pittsburgh Center for Complementary Health and Healing and can not be used without written consent.